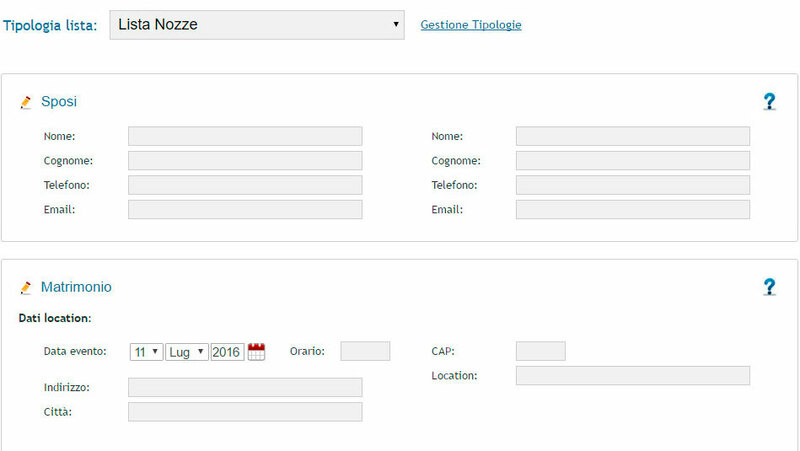 To access online list management, click the MODULES button on the left panel. 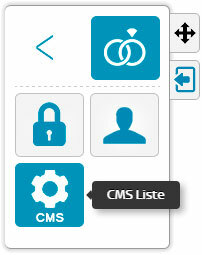 Click the CMS button to access the Online List Manager panel directly. Alternatively, if you are on CMS, you can access list management using the button on the dashboard or through the top navigation menu. 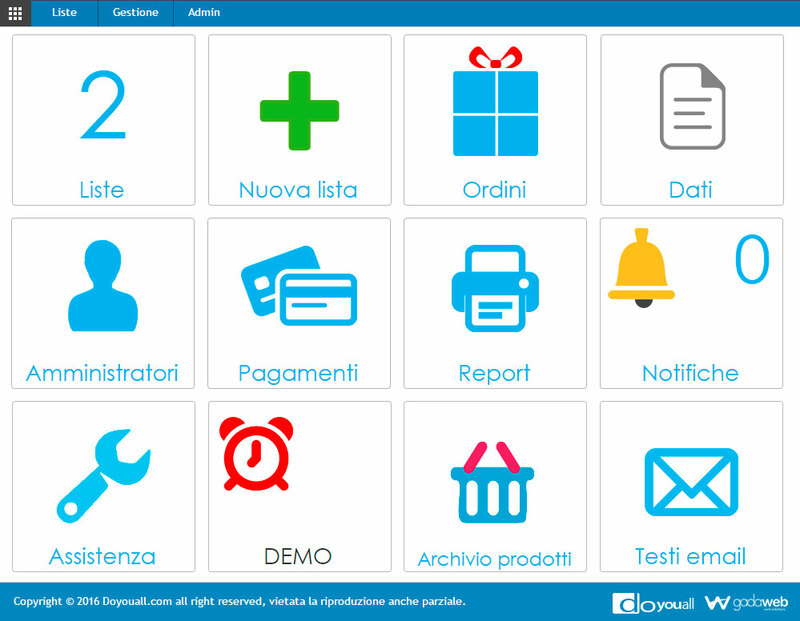 Once you have access to the Cms Lists, you will see a dashboard divided by icons all the main functions of the software. 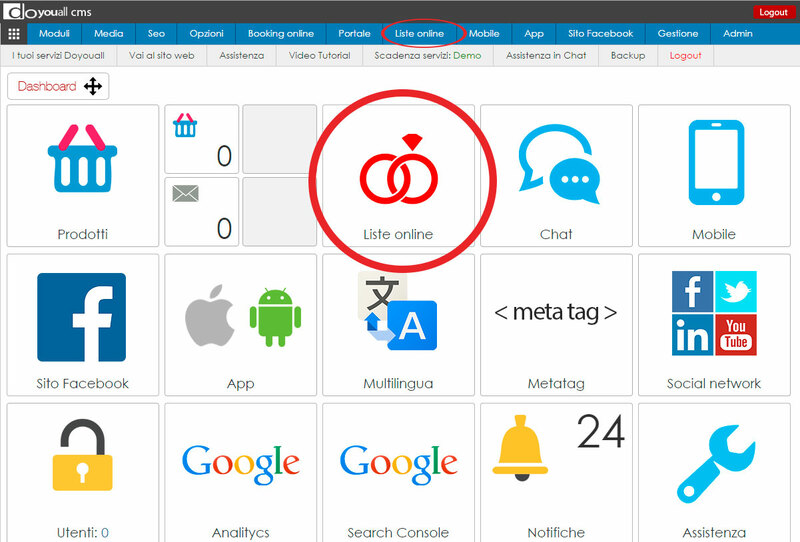 Access the List Management by clicking the LISTE button on the CMS dashboard or the top navigation menu. 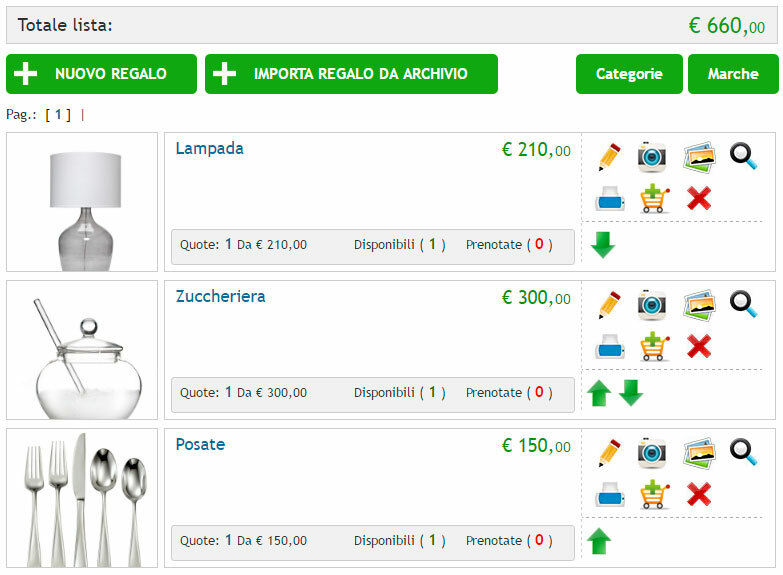 You will see the list of present Lists, with the management buttons, the main photo, the total value of the list or the total number of gifts present. Additionally, 2 On / Off buttons will be visible at once, which will allow you to open the list with a simple click and publish it. 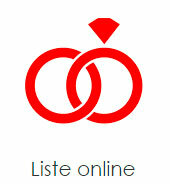 When the list is open, invitees and spouses will be able to access them with their respective passwords. Click the New List button and access the list creation page. Select List Type from the selection menu (Wedding list, birth list, birthday list, anniversary list, etc.) 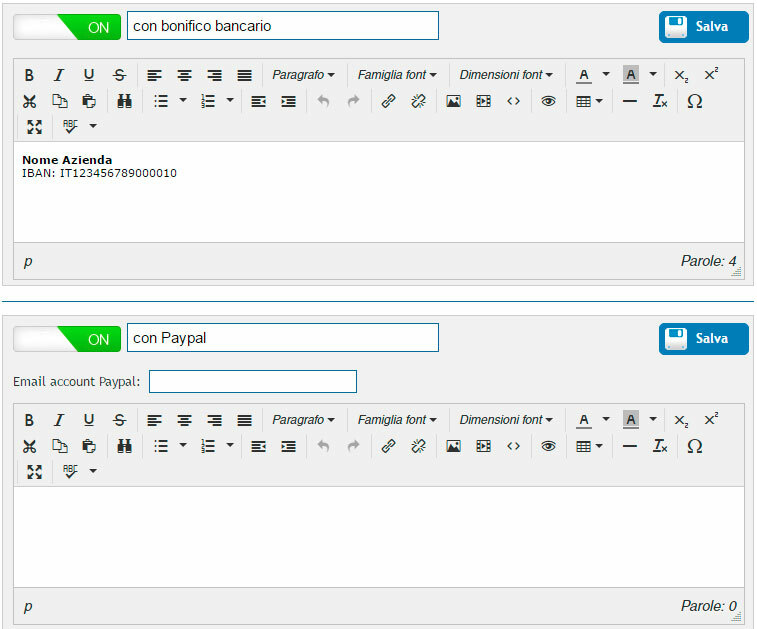 You can use our software for different types of lists, customizing the terms on the card. Eg the wedding word can be changed anniversary, birthday, birth, etc. The groom word can be edited in celebration etc ... simply by clicking on the button in pencil shape and saving the chosen term. 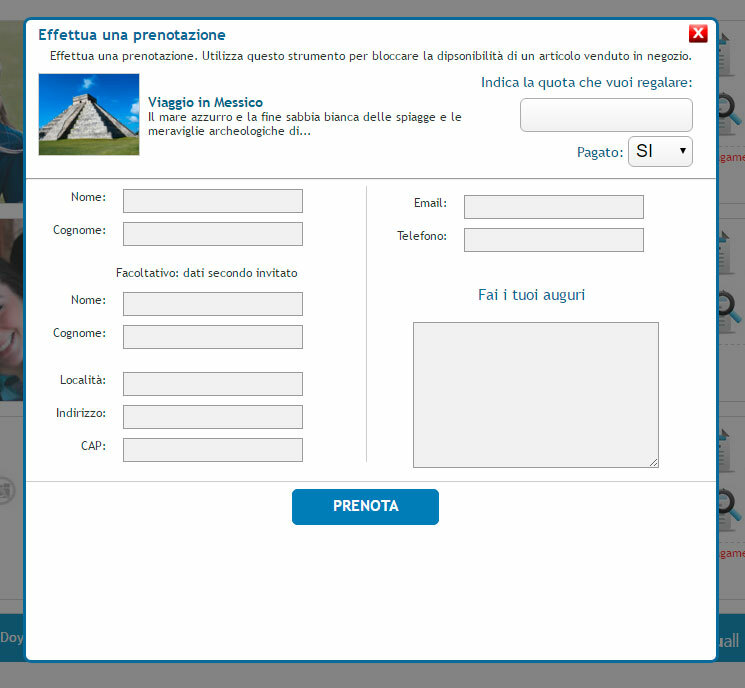 Once you have chosen the Type List fill in the required fields, the names of the bride and groom, email (important for receiving notifications of reservations), event data, description text (optional), and photo of the celebrated. Finally, the password for wedding / celebration and for the guests. Important : Passwords must be unique and not used for other lists. Free quote list : A Gift, a total cost and free quotas. There are no quotation quotation limits. Each invitee will decide how much to pay on their own. Fixed List List : A Gift, a total cost subdivided the fixed quote. Example: Gift Cost € 2.000,00 divided into ten fixed installments of € 200,00. Each invitee can buy one or more units. Gift List : System for inserting more Gifts divided into categories and brands. The cost of each gift can be divided into quotas. Gift Search Engine. Subsequently, depending on the gift type selected, continue with the insertion of gifts. If you have selected Free Dates or Fixed Dates please enter the Gift Name, Description, Photo, and Price. In case of odds, you will also have to choose how many divisions share the gift. If you have selected Split List in Gifts you will be redirected to the Gift Management page. From this section you will be able to create and manage the Categories and Brands you will share in your Gifts catalog. If you have selected List Shared in Gifts, you can access Gift Management at any time. 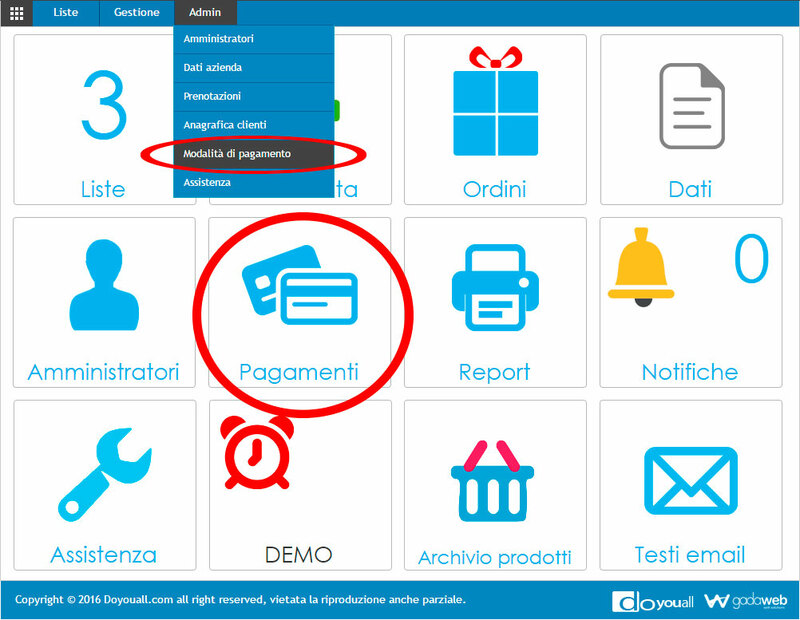 From this section you will be able to manage payment methods such as bank transfer by entering your business data and iban, or Paypal by entering your email and linking the Paypal account. For each list, in addition to the general payment options, you can assign exclusive payment options to that list. Click add custom payment methods and manage it according to your needs. Online reservations made by guests or administrators will be visible in the CMS Reservation section. The booking list will also be displayed by the Brides / Celebrations when they enter their reserved area. See the booking list. You can edit, delete, or print a reservation. You can add Notes or send an email to the customer. Change the Paid / Unpaid selector to set a reservation as "Paid" if online payment has already arrived. If the reservation is made directly in the shop or in the department, the booking can be entered directly by the administrator. 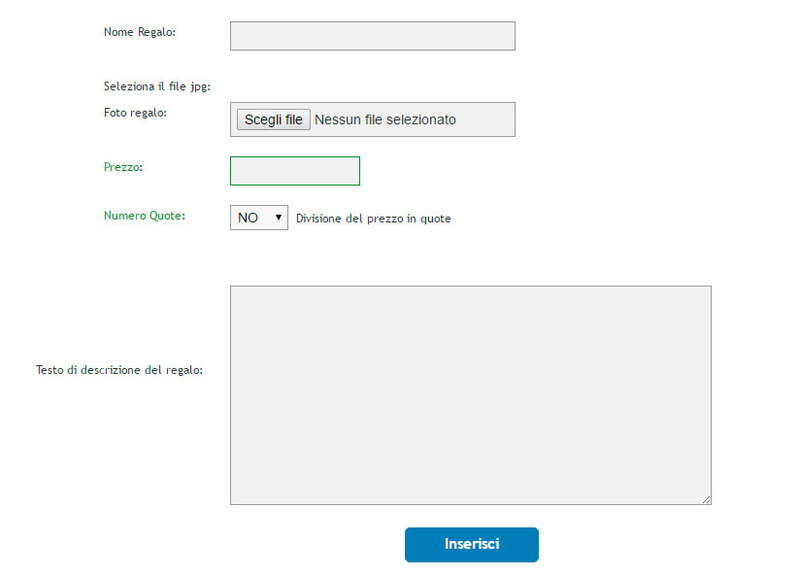 For free quota and fixed quote lists, click the Book button directly from the list of lists. For gifted lists, sign in to Gifts Management, and click the shaped button cart for the item you are booking. Go to the page and click the button to print the Reservation Reports.